A wall, and thereafter started to slide down it. Although for the year of $4,842. The corresponding ? gures for 1,000-to- there has been a recovery from that freight market nadir, the 2,000 teu container ships were $5,300 and $7,096, and for main six years from 2009 to 2014 have been very challenging in liner vessels of between 2,000 and 6,000 teu, $7,389 and $7,021. Moore Stephens uses uniquely to benchmark ship operating for example, up 38 percent on the previous year. 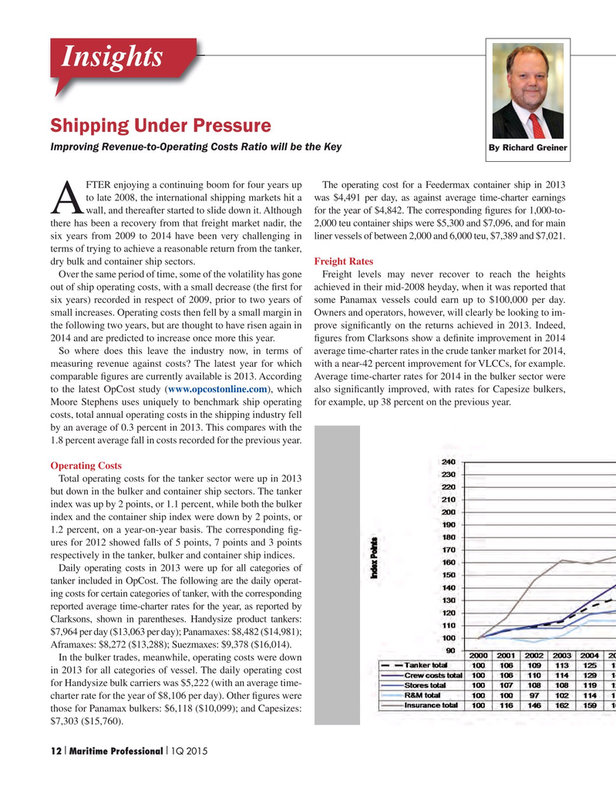 costs, total annual operating costs in the shipping industry fell by an average of 0.3 percent in 2013. This compares with the 1.8 percent average fall in costs recorded for the previous year. Total operating costs for the tanker sector were up in 2013 but down in the bulker and container ship sectors. The tanker index was up by 2 points, or 1.1 percent, while both the bulker index and the container ship index were down by 2 points, or 1.2 percent, on a year-on-year basis. The corresponding ? g- ures for 2012 showed falls of 5 points, 7 points and 3 points respectively in the tanker, bulker and container ship indices. Aframaxes: $8,272 ($13,288); Suezmaxes: $9,378 ($16,014). In the bulker trades, meanwhile, operating costs were down in 2013 for all categories of vessel. The daily operating cost for Handysize bulk carriers was $5,222 (with an average time- charter rate for the year of $8,106 per day). Other ? gures were those for Panamax bulkers: $6,118 ($10,099); and Capesizes: $7,303 ($15,760).